We are on the cusp of the robotics revolution: new technologies promise a societal shift where robots will become part of our daily lives. The UTokyo New York office invites you to rethink the robot: its function, appearance, interaction, and role in society. Be inspired by cutting-edge research in robotics, including biomimetic machine mechanics, "BioLikeness" of robots, fundamental vision theories and breakthroughs in high speed robotics. Imagine the unimaginable. Join us after for an open discussion with creative minds and drinks. 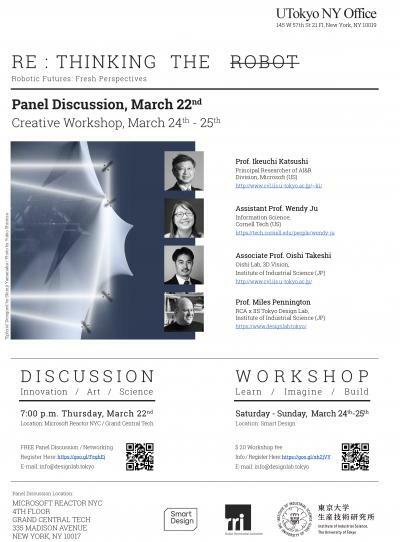 Also, UTokyo New York Office invites you to a design-thinking workshop on March 24th and 25th. Experience design-thinking methods and processes for ideation and rough prototyping. Imagine the unimaginable. A separate registration is needed.